This was a lovely place to spend a weekend on the coast. The home has nice amenities and a beautiful view of the ocean. Just a few blocks to town and easy beach access. Would definitely stay here again. Great home and company. I was able to get in 2 hours early, with a quick phone call the morning we arrived. The house was very clean, especially compared to some rentals. The king size bed was comfy. The location was awesome. Far enough away that we felt like we did not have any neighbors, but an easy 2 -3 minutes walk to the beach and about 15 minute walk along the beach, (shorter if you used the street) to stores and dining. The back yard is open to wetlands, and opens to the ocean, great views from the large deck and living room. The best Oregon Coast rental we have had in many years. I am writing the following not as a complaint, but just to help others make wise decisions: Wet lands + lots of bugs. The steps in the home are a little steeper than average. Home would be great for 1 or two couples, or small family. The two bedrooms are on opposite ends and different floors which could be a good thing. Downstairs would be great for kids and teens. The house is modern, spacious, clean, and well stocked. The kids had a blast with the books and toys, and the parents enjoyed the comfortable and spacious beds and bedrooms. The house even comes with a french press and a griddle, perfect to line people up at the kitchen counter bar for breakfast. We also loved how close we were to everything in Manzanita. We had a great weekend and will visit again! Danielle was a great host. The house was very clean and in wonderful quiet neighborhood across from the beach. Highly recommend the Beeswax-Beach house! Great home and company. I was able to get in 2 hours early, with a quick phone call the morning we arrived. The house was very clean, especially compared to some rentals. The king size bed was comfy. The location was awesome. Far enough away that we felt like we did not have any neighbors, but an easy 2 -3 minutes walk to the beach and about 15 minute walk along the beach, (shorter if you used the street) to stores amd dining. The back yard is open to wetlands, and opens to the ocean, great views from the large deck and living room. The best Oregan Coast rental we have had in many years. I am writing the following not as a complaint, but just to help others make wise decisions: Wet lands + lots of bugs. The steps in the home are a little steeper than average. Home would be great for 1 or two couples, or small family. The two bedrooms are on opposite ends and different floors which coud be a good thing. Downstairs would be great for kids and teens. Great venue with no surprise. The place was spotless. Our stay at Manzanita was amazing despite the crummy weather. The house was immaculate. There was nothing missing or anything I wished was there. I would definitely come here again with my friends and family. There were many things to love about this property, but at the top of the list was the dog-friendliness of this home. They provided dog towels, stain cleaners, toys, and a well fenced back yard. It was fantastic and Penny loved it too! It was excellent! We will definitely be back! Loved it, everything was perfect! Favorite feature of the property was the location (near town and beach) and light filled rooms. Danielle is very friendly and helpful. We appreciated her. We were very appreciative of the cleanliness of the house/property. My friends and I will be back for a repeat trip again very soon. The house really has everything you need to be comfortable. It is appointed really well and makes you feel right at home. I don't like to cook much when on vacation but if you prefer to have your meals in you will have everything you need here. The beds are great. I slept better than I do at home. It's on a quiet street with a short walk to the beach. I've been looking for a home away from home and I've found it. Will be planning my next stay as soon as I get home! The team was great, providing excellent communication and information about the property and Manzanita amenities. Thank you very much for renting this location - we had a fantastic visit! We loved the frog chorus surrounding the house. A deer came to visit. The house was so well stocked with things that I envied for my own home. We had a great breakfast by the fireplace and a nice evening in the hot tub. We wished the beds were a little more comfortable, but the location so close to the park and the beach access was unique and cool. Such a quiet neighborhood. We experienced massive hail storms, thunder, snow and of course, rain. Lovely winter weekend at the coast. Best place we've stayed in Manzanita (well over a dozen to compare with). Far enough off Laneda to be quiet, close enough to be convenient. Easy walk to the store. Very little drive-by traffic. Fantastic, wonderful view out the windows of trees and sky. So restful and relaxing. Ditto on the nice deck. The open floor plan upstairs is perfect for a couple. Comfy furniture, nice bed. Central heating is a treat (no "blow dryers" in the walls). The gas fire place was a pleasure. We're coming back in a couple months! We've found our home-away-from-home. I was very pleased with the very quick response to all of my inquiries and when one property proved to be too expensive for us I was directed to three other properties that fit our needs beautifully. We really enjoyed our time at the Beach Combers Cottage! It was very clean, very quiet and decorated in a very cute coastal theme. 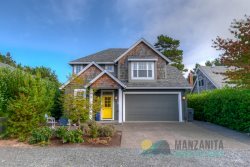 The whole process of renting through Manzanita Beach Getaway Vacation Rentals was a great experience. I will definitely be renting through them again!